HOW DO YOU DESCRIBE THE ALLURE of Marc Bolan, the front man for T Rex; or recreate the remarkable impact made by the band back in the Nineteen-Seventies? You would have to have been there to see it for yourself. And a big impact it was, the like of which the music world had not experienced since The Beatles. With charisma and talent, Marc led T Rex to phenomenal success and a whole new phrase was coined: Glam Rock, or Glitter Rock. During the early 70s T Rex was established as one of the foremost bands of the decade, producing a string of memorable hits. Electric Warrior was T Rex's second album, released in September, 1971. That was the year that Marc Bolan made it to the top and heralded a new pop era by adding a touch of glitter under his eyes for his performance of the band's fantastic Number One single Hot Love on the March 10 edition of Top Of The Pops. Before the year was out, Bolan and Rexmania was the closest anyone had come to Beatlemania since 1963. They had ignited a movement that gathered pace throughout 1971 to an amazing crescendo in 1972. Topping the charts twice, from 18 December 1971 to 29 January 1972 and again from 5 February to 19 February 1972, T Rex's Electric Warrior is an incredible collection of some of the band's great songs. Tragically this success was cut short on 16 September 1977, the day Marc Bolan was killed when his purple Mini hit a tree, just two weeks short of his 30th birthday, and girlfriend Gloria Jones was badly injured. Inevitably, the band broke up. Now T-Rex's magnificent album Electric Warrior is to be released in a brand new multi-format edition for 23 April 2012 to celebrate the 40th Anniversary of Glam Rock  or, as some would have it, Glamiversary. Universal Music releases a Deluxe, Super Deluxe, special vinyl and digital exclusive editions of T Rex's monumental Electric Warrior album. This is preceded by a box set of vinyl singles (Electric Sevens), produced especially for Record Store Day 2012 (21 April). The four 7-inch singles are pressed on heavyweight vinyl and feature unique sleeves. 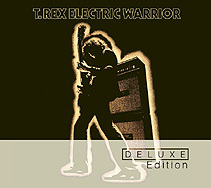 These new editions contain previously unreleased demos and out-takes and the centerpiece is original producer Tony Visconti's remastered version of Electric Warrior, presented with four bonus tracks: The non-album single Hot Love (No 1 in February 1971) plus the B-sides There Was A Time / Raw Ramp, King Of The Mountain Cometh and Woodland Rock. Two eternal favourites are the delightful and compulsive Cosmic Dancer and the upbeat Jeepster (For Your Love). T Rex prove their worth with Monolith and continue with sounds as distinctive and individual as T Rex themselves. Take, for instance, the gorgeous blues-infused Lean Woman Blues and the ever-fresh, optimistic Get It On. Wonderful. T Rex also added refreshingly different and interesting tracks with The Motivator, King Of The Mountain Cometh and Woodland Rock, just to demonstrate the band's versatility. Throw in the intriguing Sailors Of The Highway and the quirky Planet Queen and you have a marvelous collection of songs. Listen to Marc Bolan's beautifully soft voice with controlled power. This package is, well, Electric! The second disc in the Deluxe and Super-Deluxe editions opens with Marc Bolan reciting a previously unreleased poem entitled The Electric Warrior. This was recorded for a US Radio promo and is featured in its entirety at the end of the album. Then comes an alternative version of the Electric Warrior album put together from previously unreleased demos and out-takes. In addition there are unreleased demos recorded in London and New York of a recently-discovered untitled instrumental from the Hot Love sessions and a fine T Rex cover of Carl Perkins' rockabilly classic Honey Don't. The Limited Edition Super Deluxe Edition of Electric Warrior is housed in a lavish box set which is foil blocked and debossed and contains the two CDs plus a DVD of rare and unreleased TV performances and promos by the group. There is also a wealth of additional items, alongside a 32-page hardback book featuring a brand new essay from Bolan biographer Mark Paytress that includes new interviews with those who were close to Marc. The box also includes reproductions of rare photos and memorabilia: a poster including a timeline; three photographs; a coaster; and a vintage press release. The DVD includes the only two surviving Top Of The Pops performances from the BBC archive of T Rex's Electric Warrior-era hits Hot Love and Get It On, the latter featuring Elton John. The DVD also includes the previously unseen Blue Screen versions of Jeepster and Life's A Gas from Germany's Beat Club plus the actual broadcast versions of Jeepster and Life's A Gas. The rarely seen official promo videos for Get It On and Jeepster are also included, plus live performances of Girl and Cosmic Dancer which were recorded at the performance of T Rex's historic Wembley Empire Pool concerts on 18 March 1972. These were not included in the concert film Born To Boogie, which used none of the matinée concert footage. Tony Visconti's re-mastered version of the album will be released on vinyl for the very first time as a double LP and tracklistings for all the formats are included below.  Universal Music is pleased to announce a Deluxe, Super-Deluxe, a special vinyl and digital exclusive editions of T Rex's monumental Electric Warrior album on 23 April 2012. It will be preceded by a box set of vinyl singles (Electric Sevens) produced especially for Record Store Day 2012 (21 April 2012). 1 Mambo Sun | 2 Cosmic Dancer | 3 Jeepster | 4 Monolith | 5 Lean Woman Blues | 6 Get It On | 7 Planet Queen | 8 Girl | 9 The Motivator | 10 Life's A Gas | 11 Rip Off | Bonus Tracks: 12 There Was A Time / Raw Ramp (B-Side) | 13 Hot Love (A-Side) | 14 King Of The Mountain Cometh (B-Side) | 15 Woodland Rock (B-Side). 1 Electric Warrior Poem (Rare US Radio Promo) | 2 Mambo Sun (Instrumental Edit) | 3 Cosmic Dancer (Single-Vocal Version)* | 4 Jeepster (Single-Vocal Version)* | 5 Monolith (No Backing Vocals Version)* | 6 Lean Woman Blues (Single Guitar Track: Work In Progress)* | 7 Get It On (Full Length Version)* | 8 Planet Queen (Acoustic Version)* | 9 Girl (New York Demo)* | 10 The Motivator (Work In Progress)* | 11 Life's A Gas (Studio Out-Take)* | 12 Rip Off (Instrumental)* | 13 Raw Ramp (London Demo Version) | 14 Electric Boogie (London Demo Version)* | 15 Honey Don't (Studio Out-Take, Work In Progress)* | 16 Planet Queen (Acoustic Solo, London Demo Version)* | 17 Girl (Acoustic Solo, London Demo Version)* | 18 Jeepster (Electric Home Demo Version)* | 19 Get It On (Acoustic Home Demo Version)* | 20 Untitled Instrumental (Studio Out-Take)* 21 Electric Warrior Poem & Radio Advert (US Radio Promo)*. 1 Hot Love (Top Of The Pops, 24 March 1971: First Time On DVD) | 2 Get It On (Top Of The Pops, 20 December 1971, featuring Elton John) | 3 Jeepster (Beat Club, Germany: Previously unseen Blue Screen Version) | 4 Life's A Gas (Beat Club, Germany: Previously unseen Blue Screen Version) | 5 Girl (Live at Wembley Empire Pool, 18 March 1972) | 6 Cosmic Dancer (Live at Wembley Empire Pool, 18 March 1972) | 7 Get It On (Official Promo) | 8 Jeepster (Official Promo) | 9 Jeepster (Beat Club, Germany: Broadcast Version) | 10 Life's A Gas (Beat Club, Germany: Broadcast Version). A1 Hot Love (Single Version) | B1 Unnamed Instrumental, aka A Lot Of Rubbish (O/T)* | B2 Hot Love (No Strings Version). A1 Get It On (Single Version) | B1 Raw Ramp (London Demo Version)* | B2 Get It On (Acoustic Demo)*. A1 Jeepster (Single Version) | B1 Life's A Gas (Electric Demo)* (2.22); B2 Jeepster (Electric Demo (2.15). A1 Sailors Of The Highway (2:46) (BBC Radio 1 Club, 3 August 1971) | B1 Girl (2:13) (BBC Radio 1 Club, 3 August 1971) | B2 Electric Boogie (1:47) (BBC Radio 1 Club, 20 July 1971*).